Hire the best and the most reliable PHP developers in the market at cost effective rates at HK Technolabs. Our PHP developers are nurtured with talent and are committed towards work. Hire dedicated PHP developers who ensure you to deliver the most robust, unusual and exceptional solutions for your business with the best tools and the most efficient process. PHP has become more popular than those of other scripting language programs and is widely used all over the world. PHP is cross-platform compatible, thus is widely is used to create desktop applications using advanced PHP features. The user gets real-time access, thus you can create a summary of the accesses of the users. For programmers, the PHP language is simple and faster to interpret, flexible, secure and thus deliver the most innovative web development solutions. why hire a dedicated PHP developer form HK technolab? 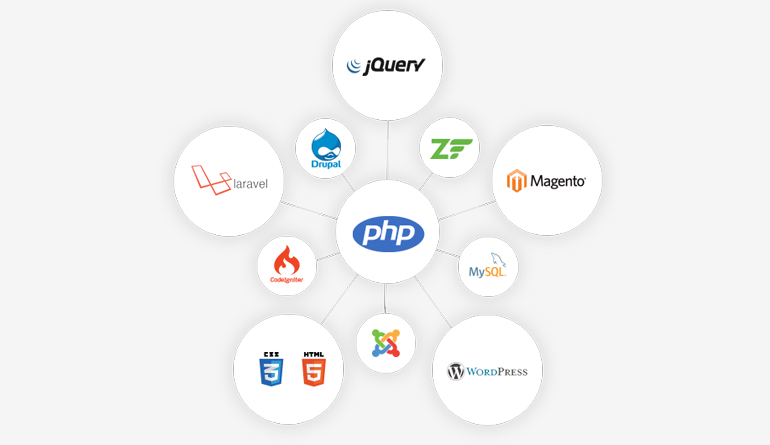 Hire a PHP developer from a pool of professionals. Our PHP developers tend to meet all your requirements. Convenient access to wide-range of PHP experts with diverse skills-sets. Hire dedicated PHP developers at your convenience, work requirements, and your development strategies with cost-effective models. Get in touch with the most workaholic team of Php developers working to make your every ounce count.